Pope Francis met with four British imams in the Vatican Wednesday morning, just two weeks after an Islamic radical drove his car through pedestrians on a crowded London bridge, killing three. 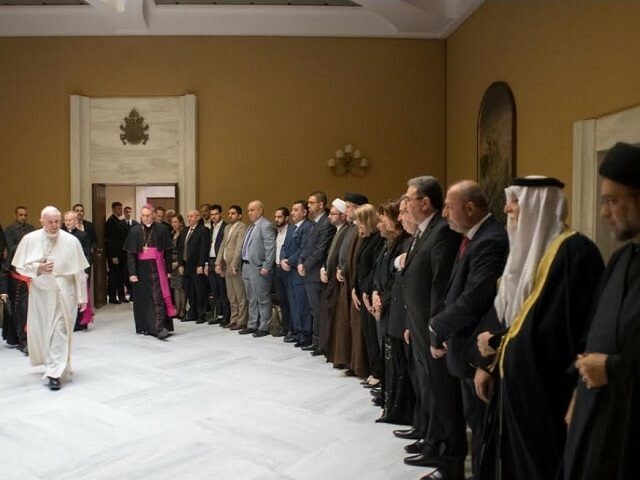 An official press release from the Vatican said that the Pope had received in audience “a delegation of Muslim leaders from Great Britain,” which included the president of Majlis e ulama Europe, the chairman of the British Muslim Forum, a co-chair of the Christian-Muslim Forum and the director general of the Scottish Ahlul Bayt Society. In his brief address to the Muslim leaders, however, Pope Francis spoke exclusively of the importance of listening to others, avoiding the question of Islam and religious violence altogether. In an interview Tuesday, one of the four imams, the vice-president of the Christian Muslim Forum, Ibrahim Mogra, called Pope Francis “a brave man” for his willingness to defend Muslims. Mogra also said that people in the West are guilty of a “double standard” in dealing with predominantly Muslim nations. “In Egypt, the United States allowed the army to take power notwithstanding the democratically elected government of the Muslim Brotherhood,” he said. Cardinal Vincent Nichols, the Roman Catholic archbishop of Westminster who accompanied the imams to see the Pope, said that the Muslim community is slowly gaining the confidence to speak out and condemn Islamic extremism. “That is the voice that has to be heard to counter the rather more undifferentiating, unappreciative and even hostile voices that view Islamic people in Britain as somehow alien and unwelcome,” he said. Later this month Pope Francis will travel to Cairo and will visit the Al Azhar University, Sunni Islam’s most prestigious academic institution.